ALEXANDRIA, Va. (June 04, 2008) -- Hundreds of members of the Army's logistics community gathered to be recognized for their contributions to the Army during the 2008 Combined Logistics Excellence Awards ceremony and banquet June 3. Soldiers and Army civilians representing 85 winning and runner-up organizations were present at the ceremony to receive plaques on behalf of their organizations. Awards were offered for excellence in maintenance, deployment and supply. Winners were chosen from across the total Army -- to include Active, National Guard and Reserve components. 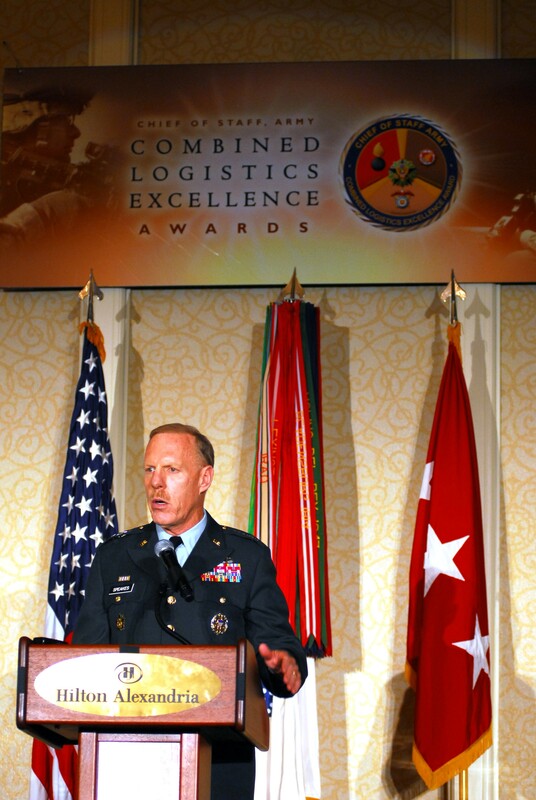 Lt. Gen. Stephen M. Speakes, deputy chief of staff, G-8, spoke to the Soldiers and Army civilians gathered June 3 at the Army's Combined Logistics Excellence Awards. Lt. Gen. Ann E. Dunwoody, deputy chief of staff, G-4, presided over the ceremony. Before announcing the ceremony's guest speaker, she told logistics Soldiers the Army is proud of them. "There is something about being in a room surrounded by a bunch of winners -- it just feels really good," she said. "Our Army is extremely proud of you and so am I. To all of you, you represent what is good about our Army." Lt. Gen. Stephen M. Speakes, deputy chief of staff, G-8, spoke to the Soldiers and Army civilians, commenting on what they had done for the Army and comparing them to the logisticians who kept Soldiers supplied during World War II. "You have to go back to WWII to see an Army that has sustained combat formation, in combat, the way you have -- (to find an Army) to be able to compare and contrast what you have achieved. That is no small tribute to your accomplishments." Among the units named winners during the ceremony was the 180th Transportation Battalion, 4th Sustainment Brigade, 13th Sustainment Command (Expeditionary), III Corps, from Fort Hood, Texas. The battalion was named winner of the Deployment Excellence, Active Duty Supporting Unit award. Staff Sgt. Jose Latorre was in Washington to receive the award on behalf of his unit. He said teamwork amongst his peers is primarily responsible for the unit winning its award. "We have been preparing for several months with the deployments we handle in the Fort Hood area," he said. "We have deployed several divisions. The last deployment we did was for the 3rd Armored Cavalry Regiment. On the last rotation it was the 31st Infantry Division. Our teamwork, our organization, has been very tight -- which is why we have been so successful in deploying so many big divisions -- like 4th ID and 1st Cavalry. This is the cream of the crop." The U.S. Property and Fiscal Office, Camp Douglas, Wis., was named winner of the Supply Excellence, National Guard, Supply Support Activity award. Warrant Officer Duane Streeck, a warehouse supervisor there, received the award on behalf of his unit. The USPFO at Camp Douglas runs a supply warehouse for the State of Wisconsin National Guard. The unit issues new equipment in addition to taking in old and unserviceable equipment for turn-in to depots or the Defense Reutilization and Marketing Office. Streek also said teamwork between the Guardsmen there is responsible for helping the unit win its award. "Among the people we have working for us, everybody is committed to the job we have to do," he said. "There's only 11 of us, so without the teamwork we have, we wouldn't be able to accomplish our mission." Representatives of the winners of the Combined Logistics Excellence Award were treated to a day in Washington, D.C., to a tour of the Pentagon, and to VIP seating at the Twilight Tattoo.